← NC in Focus: Where were NC voters born? The chart below highlights the racial/ethnic composition of North Carolina’s population by five-year age group. Racial/ethnic groups that have long been present in North Carolina—white, black or African American, and American Indian—are shown in varying shades of blue. The orange shaded areas of the bars highlight racial/ethnic groups whose presence in the state has increased significantly over the past 25 years. This includes Asian and Hispanic residents, as well as individuals who identify as 2 or more races. In 2015, North Carolina’s population was 68% white. Thirty-two percent of state residents belonged to a racial/ethnic minority group: 20% black or African American, 2% American Indian, 1% Asian, 2% multiracial, and 7% Hispanic. The racial/ethnic composition of individuals 40-44 was nearly identical to the overall composition of the state overall in 2015. At younger ages, the populations were significantly more diverse. 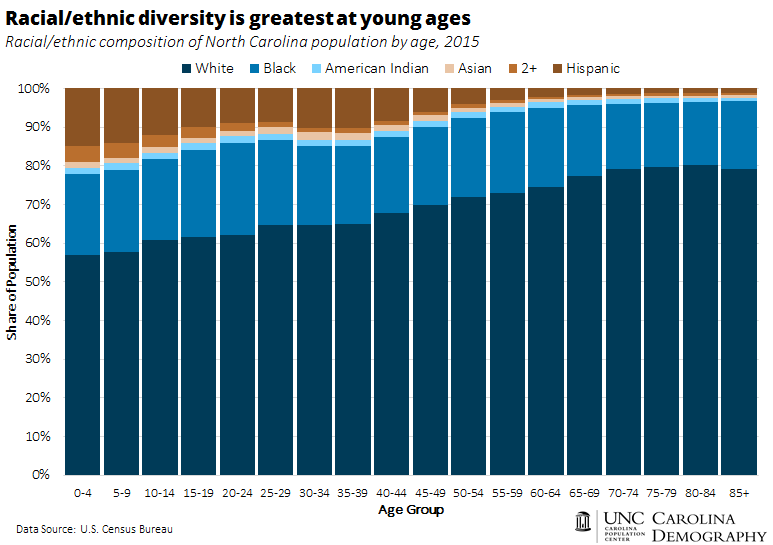 The most visible difference is the growing share of the Hispanic population, rising from 8% among North Carolina’s 40-44 year-olds to 15% among the youngest age group (0-4). Younger individuals are also much more likely to belong to two or more racial groups; less than 1% of individuals age 40 or older are multiracial compared to 4.3% among North Carolina’s 0-4 year-olds. This entry was posted in Carolina Demographics and tagged age, diversity, population estimates, race/ethnicity, U.S. Census Bureau. Bookmark the permalink.